Robrecht Louage has already accustomed us with very original designs year after year. As an avid IPP contestant, Robrecht always enters his new puzzles at the yearly International Puzzle Party, and this year's Ottawa event was no different. Even though it didn't earned any award at the competition, Robrecht's latest creation, the 8 Stars Labyrinth, deserves all the credit for its originality. If you have followed the Belgian designer's work over the last few years, then you'll immediately notice something's missing in his new design. That's right, there's no coin to be freed this time around, but even so there's no excuse why you shouldn't try this one out. 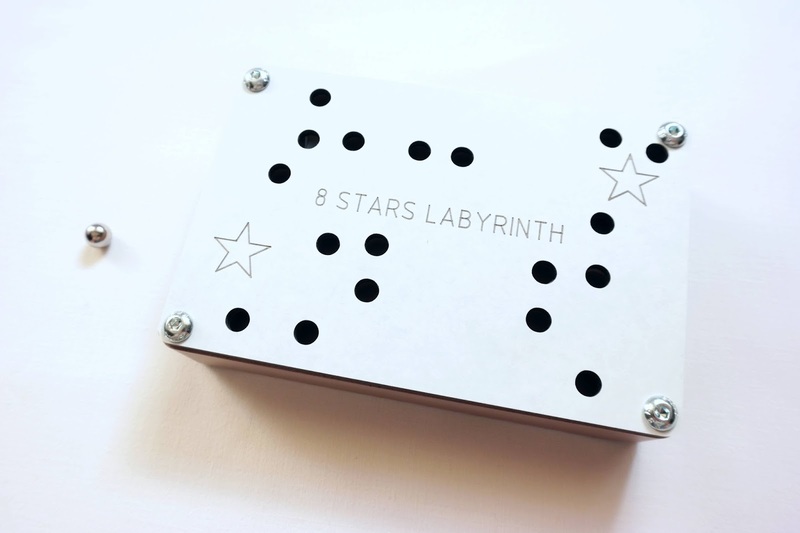 For lovers of labyrinths, mazes and hidden paths, the 8 Stars Labyrinth offers you a perilous journey through an obstacle-ridden trail, which only the most adventurous puzzlers will be able to overcome. What remains common from other previous designs is the use of Trespa - An unusual but strong material made by combining Kraft paper and phenolic resin, resulting in this light-brown color seldom seen in any other puzzles, but in reality it's a great fit for an otherwise unusual puzzle itself. 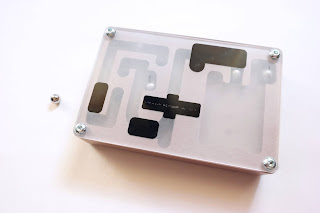 The top of the puzzle is covered with a semi-transparent polycarbonate sheet, which gives this foggy appearance to the labyrinth, as if you were roaming around in an eerie mist. 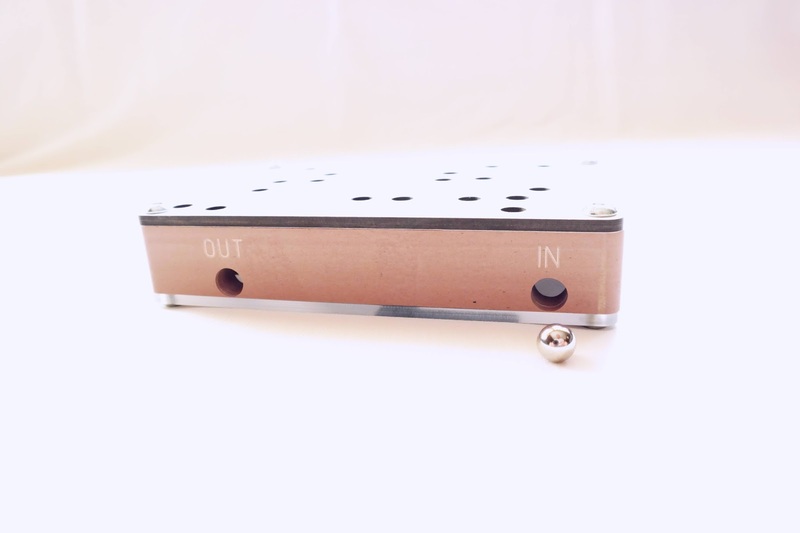 To start your journey, you must insert the small metal sphere in the "IN" hole found at the right of one of the sides. I believe the name of puzzle has something to do with the number of traps you can find scattered throughout the path, which is eight, if I'm not mistaken: right after you insert the sphere there's another one by the entrance, preventing you from going back in case you ever regret entering this fiendish labyrinth; following this welcoming committee is a blacked-out stretch of the path that doesn't let you see what type of trap you're facing. Here, like the other three similar traps that await you, you need to figure out how to advance to the next obstacle unscathed. Each of these four "black" traps is unique and present you with a different challenge, so proceed with caution as you approach them; farther in, you'll see another trap just like the one you encountered when you first entered the maze. 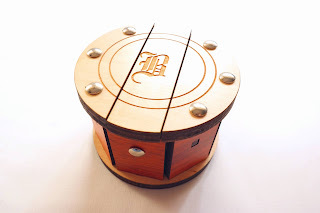 You'll need some dexterity skills to pass through this one, but it shouldn't give you much trouble; one of the hardest parts of the puzzle is the hidden labyrinth at the bottom. Most of the path is covered by a plaque full of small holes that only let you see the sphere at certain points. You have to navigate through this maze mostly by instinct until you find the exit, just before passing through the last black trap; there's a final trap close to the exit, so you need to move the sphere slowly in order to avoid the pitfall ahead. I must commend Robrecht for not being afraid to leave his comfort zone in terms of puzzle designing and to take a chance at trying different concepts other than the usual "free the coin". The effort certainly paid off, because the result, as you can see, is absolutely brilliant and the execution of the overall concept is, as always, perfect in every way. Availability: To get a copy of the 8 Stars Labyrinth, please contact Robrecht at: rlouage(at)telenet(dot)be. Note that the e-mail is presented that way to avoid spam. You just need to change what's inside the brackets. 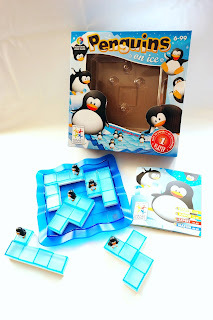 If you find yourself struggling with the heat outside, SmartGames has the perfect solution for you with an icy adventure through the Antarctic. 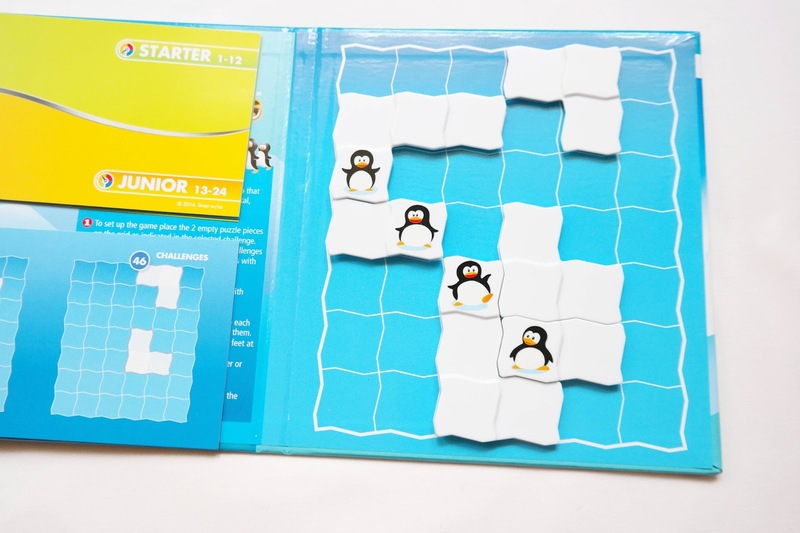 Designed by Raf Peeters, Penguins on Ice is a packing puzzle with a twist - a pentomino twist. 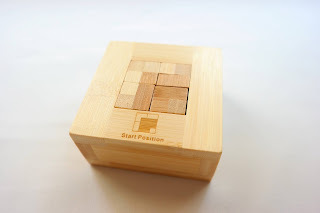 Being a packing puzzle fan, I was very excited to discover the original way the designer found to change an apparently simple game into a rather dynamic one, with its pieces constantly changing the landscape of the board, while at the same time providing a really good challenge for puzzle lovers. The game is very well made, just like any other from SmartGames. 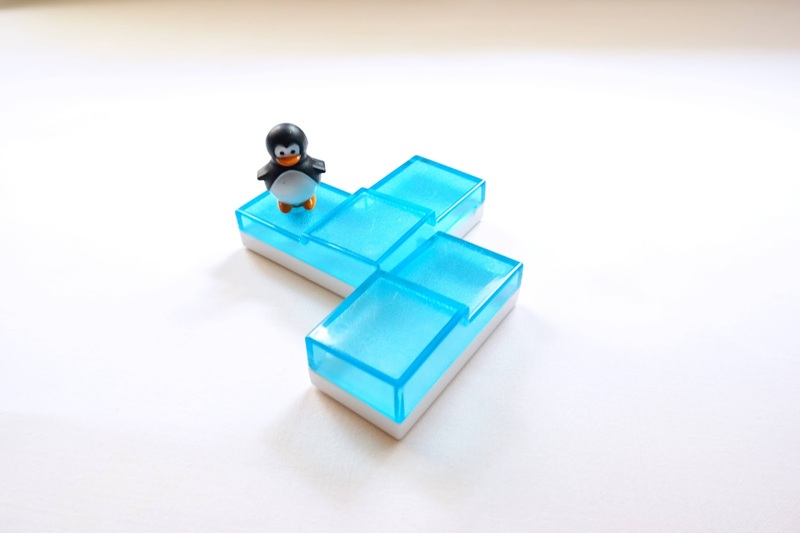 The pieces are transparent-blue, to give the effect of ice blocks, and the penguins are attached to one particular spot on each one. You can rotate the penguins in 360º, but this is not relevant for the solutions, because only their relative position within the game board is important. 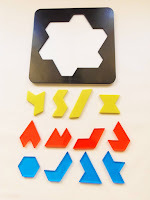 The game consists of only five pieces, each one with the ability to change into three or four different pentomino shapes by sliding the two parts back and forth until you find the desired piece. The sliding movements can only be made in two opposite directions (a straight line). 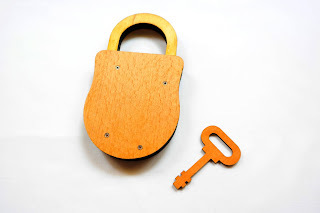 The pieces have a locking mechanism that alert you with a click when it's in place. Also, the game board is neatly divided into a 5x5 grid, with raised contours around each square, so the pieces fit perfectly without moving. You can see in the example below one of the pieces with its three different positions. 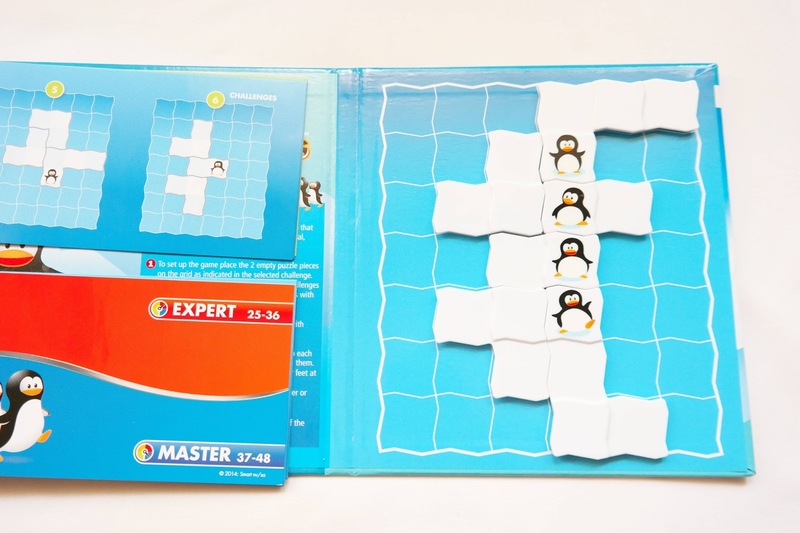 The rules are simple: Just choose any of the 60 included challenges in the booklet and heed the position of the penguins in the picture - Note that the penguins are stationary within each piece. The only way to change their positions is to rotate horizontally any given piece. 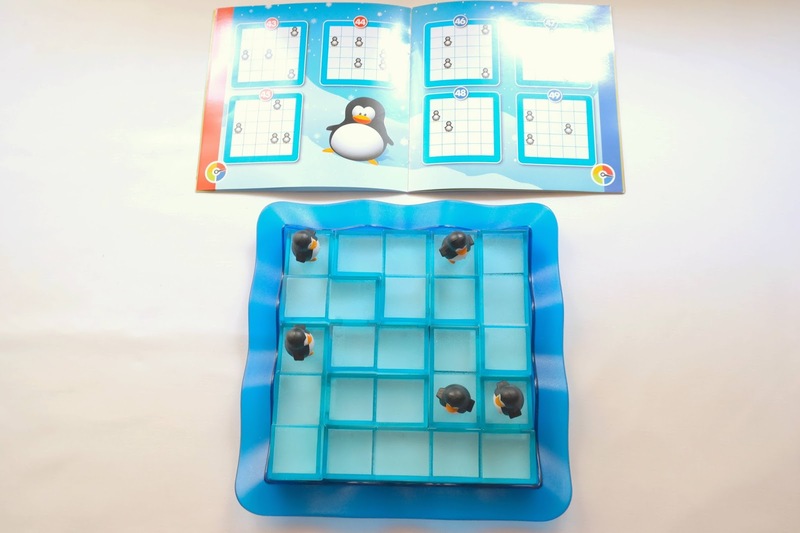 Next, you need to find a way to arrange all five pieces inside the game board, while still making sure that the penguins match the same positions of the corresponding challenge. 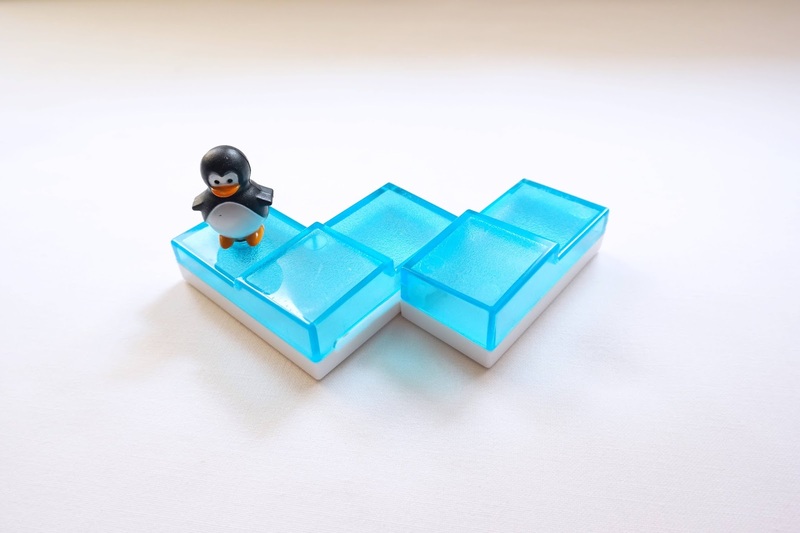 You can choose the positions of the penguins that don't appear in the challenge you're currently solving. 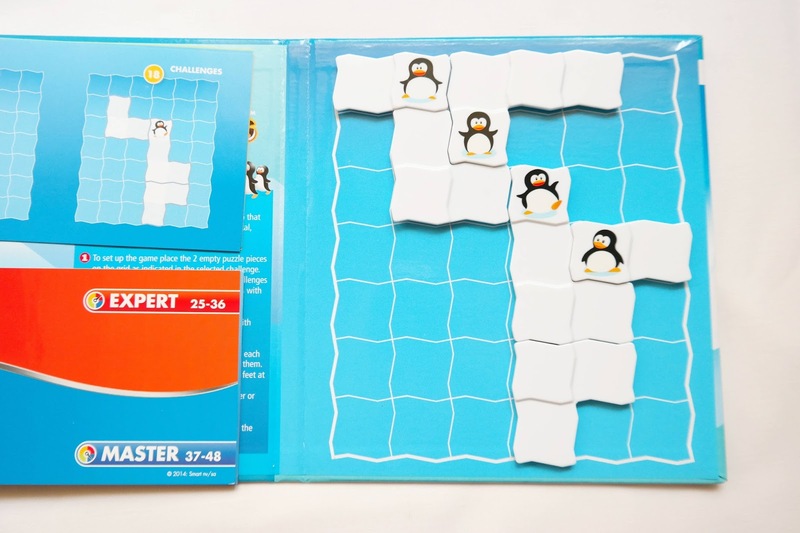 The first challenges start off quite easily, with the shape of all the pieces already outlined in the game board and a couple of penguins in place. 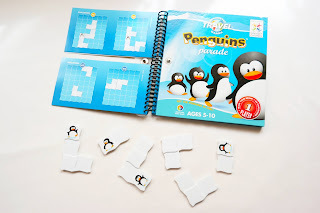 As you work your way through the 60 challenges and four difficulty levels you'll see that fewer pieces remain outlined and more penguins start to show up for the party. 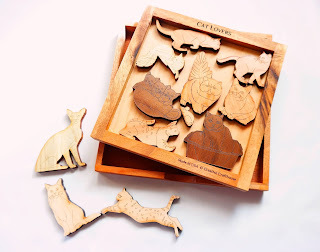 The last challenges are really tough, and you'll find yourself continually changing the shape of the pieces to see which ones fit in a particular spot. All challenges have only one possible solution. 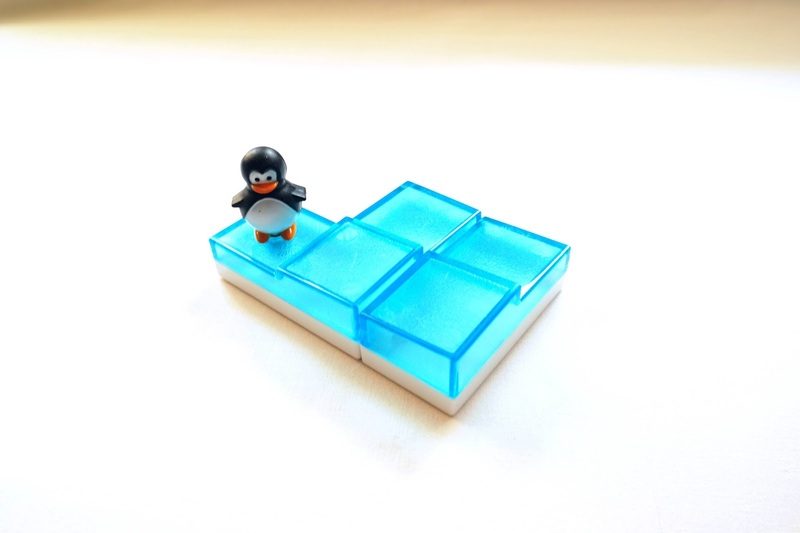 The design of Penguins on Ice is pure genius. 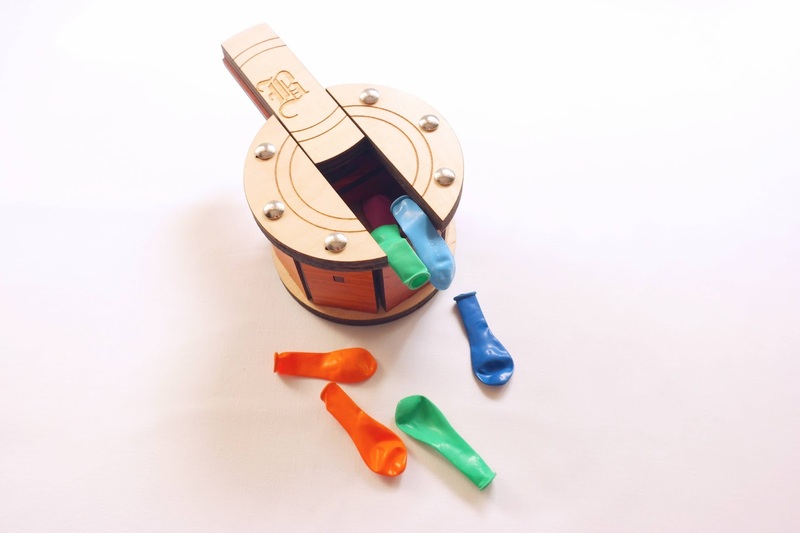 It's incredible how such a simple concept of sliding two parts to make different shapes can turn an ordinary game into an extraordinary one, becoming a great brain exercise in the process, while providing a completely fun and cool experience. This is now one of my favorites from SmartGames. Brainwright has been issuing lots of great puzzles lately. 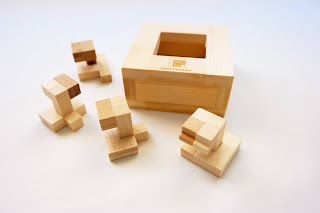 I commend their creative department for discovering and bringing these magnificent puzzles to the masses, which otherwise could remain unknown for many of us. Fortunately for me, I already know about Kate Jones' work and her fantastic contributions to the puzzle community over the last few decades. 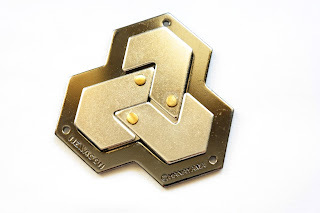 First produced by Kadon Enterprises, the Iamond Hex puzzle is now reissued with a new look, more affordable, but all that made it a great puzzle is still present in all its glory. 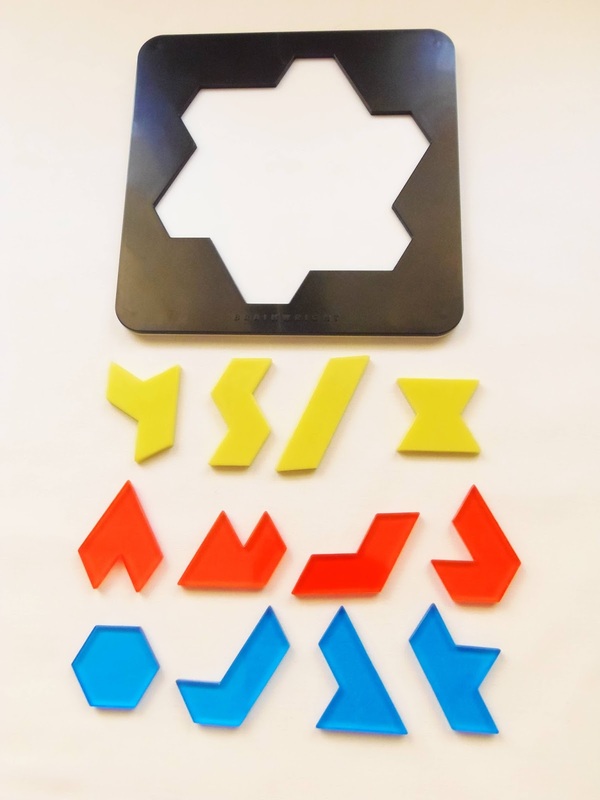 Made with 12 dissimilar acrylic pieces in three colors (yellow, red and blue), the Iamond Hex puzzle features all kinds of shapes made possible by joining six equilateral triangles at different angles (hence the name Hex). No two pieces are the same and they all interact with each other in different ways. 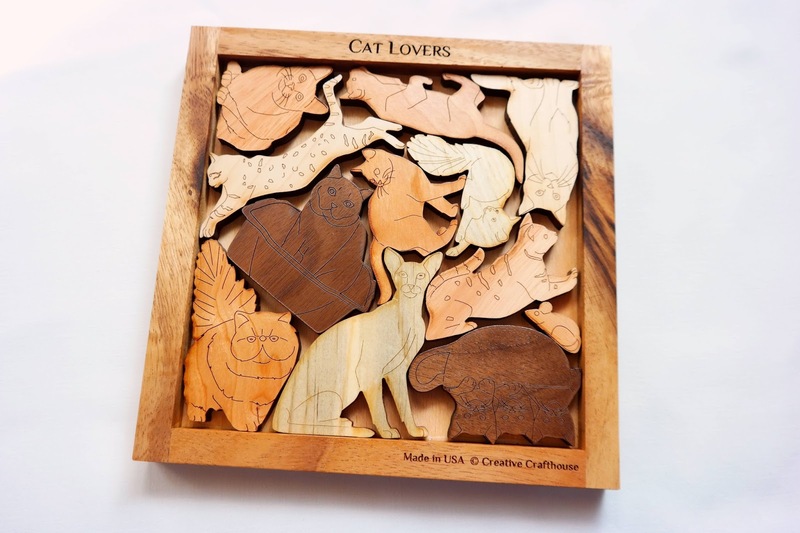 This makes the puzzle quite versatile, so you can create countless patterns and figures beyond the main puzzle featured in the provided tray. There are many solutions for the main petal-shaped puzzle. 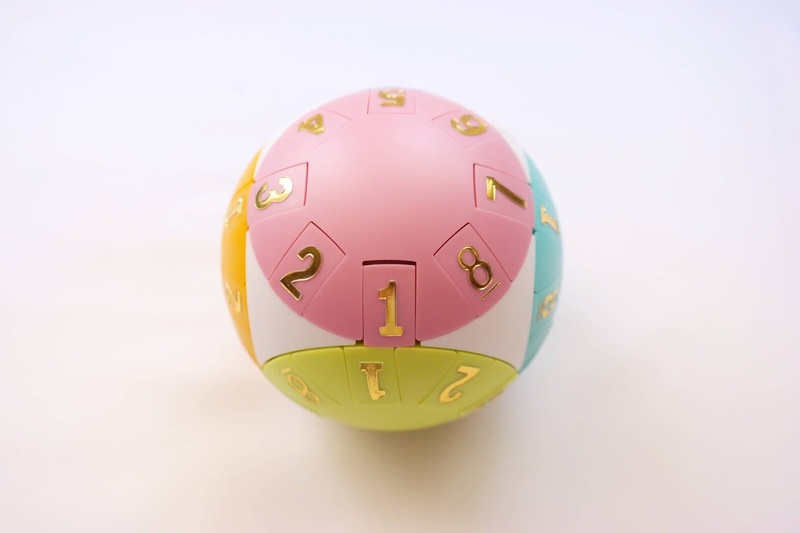 By mixing and combining the colors in different patterns, you can find a total of 55 solutions, some of which are very difficult to solve, like getting all three colors grouped. 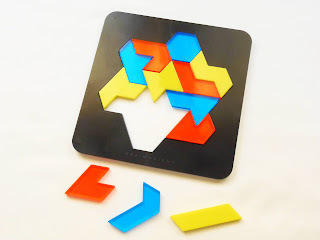 Kate Jones' puzzles are always a joy to play with, because of their many solutions and possible shapes you can create with the puzzle's given pieces - They give you a lot of bang for your buck, and are worth every penny. The Iamond Hex comes packed with lots of challenges, like symmetrical shapes and other interesting puzzles using only some of the pieces. 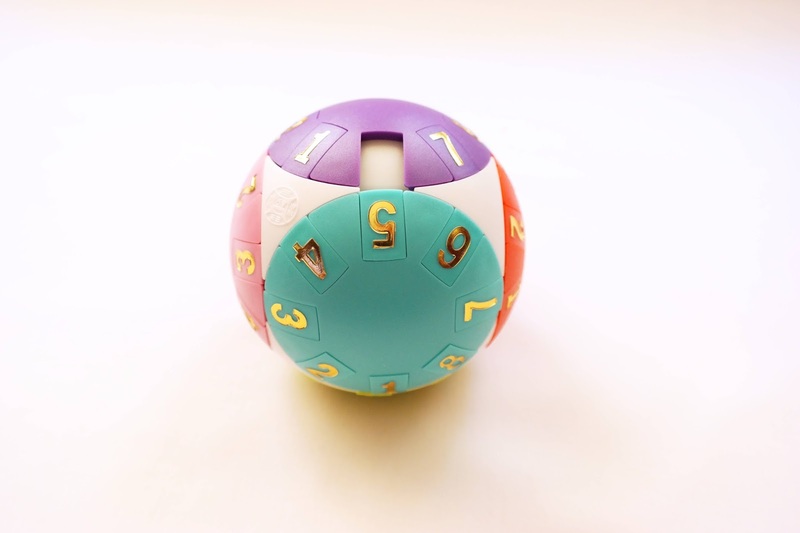 For example, with just four pieces you can create double-sized models of each of the 12 hexiamonds. Which pieces to use will of course be up to you to find out. An even more difficult challenge is to make a tripled model of 9 of the hexiamonds, since three of them are not possible. Doing all of them will certainly keep you busy for a while, if you don't give up by then. 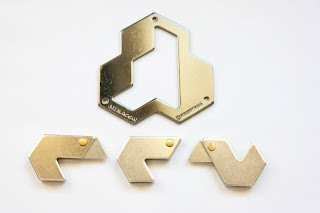 The most interesting challenges, however, are the symmetrical shapes you can create out of the tray. There are hundreds of possibilities to discover, and included in the booklet are 15 for you to solve. 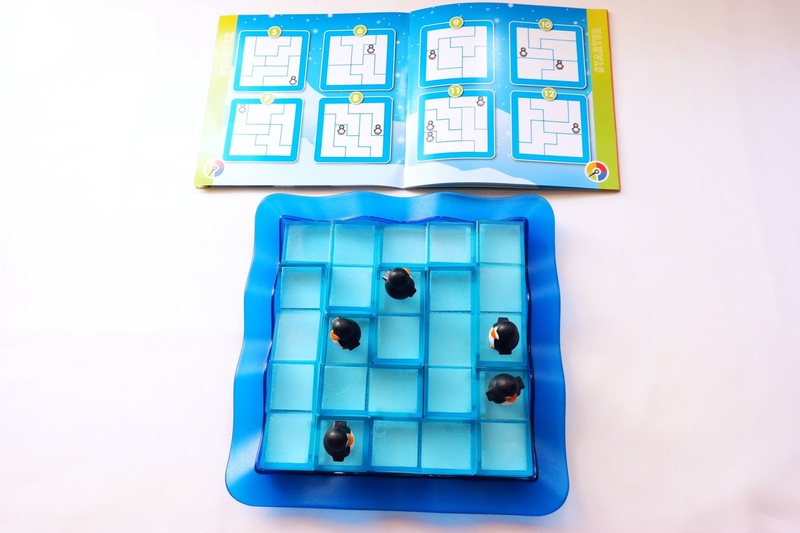 Be warned, though, these are very difficult, because you won't have the tray to guide you by limiting the edges of your puzzles. This is why the symmetrical shapes are so challenging, but also so addicting. 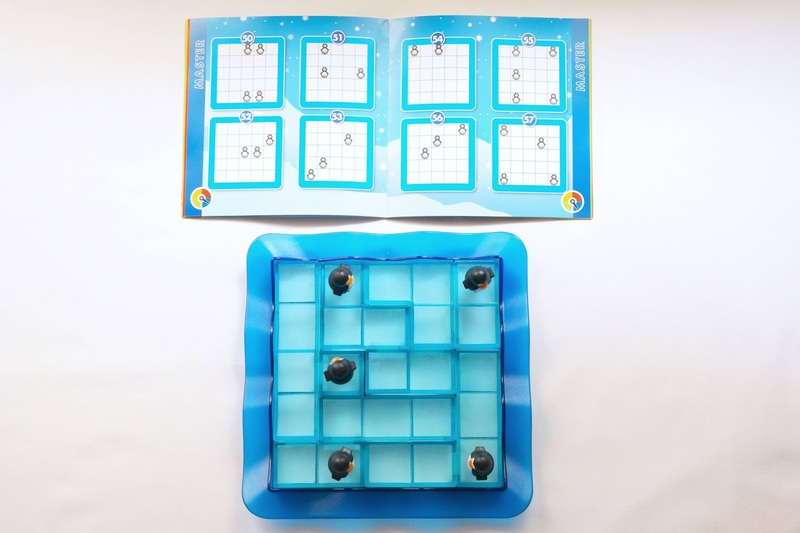 Finally, if you like to play strategy games, you can play a couple of them, included in the booklet. 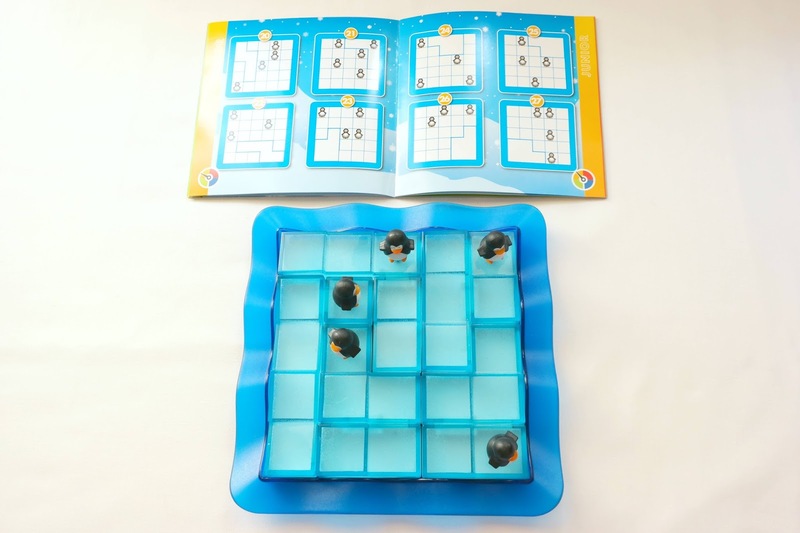 Rules and explanation of the games are easy to understand, so anyone will be able to enjoy playing with friends. Whether you like to play solo or with someone, you can be certain that you will thoroughly enjoy Brainwright's Iamond Hex. There are hundreds of challenges and solutions here to make any puzzle fan happy for a while, and for under $20, it's difficult to find a better choice to occupy your free time in the next few weeks. 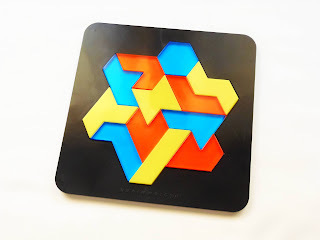 Availability: I got my copy of the Iamond Hex puzzle from PuzzleMaster, which is available for just $16.99. Check out many other interesting puzzles from Brainwright. The Cerebral Rings by Mag-Nif is actually a version of a puzzle believed to be around since the 17th century. It is said that the original, or an early version was found among the effects of astronomer Johannes Kepler. It is not clear, however, if he is the actual designer of the puzzle or if it was one of his colleagues. 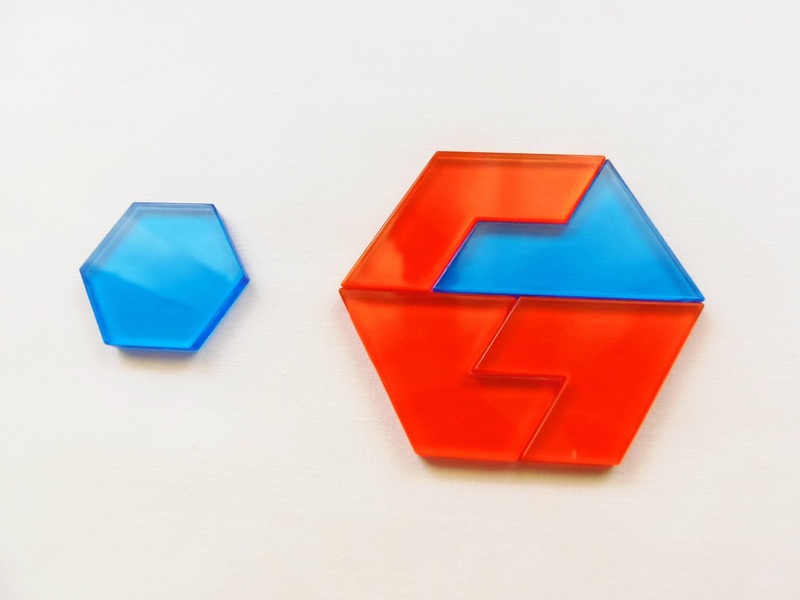 This is an interlocking puzzle made by just three identical pieces. They are so well joined that you need the correct sequence of red buttons (one of four positions) in order to separate the pieces. The puzzle consists of a circle made by six stacks of rings, which at first sight seem to be impossible to separate. 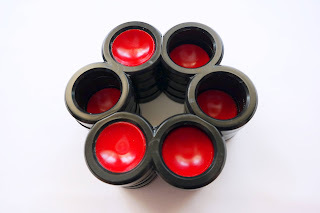 The buttons, or plungers, can be pushed up or down along the length of the stack to allow the pieces to be unlocked and separated. The movement of the puzzle is quite smooth, but it releases this strange paste that is probably used as lubricant. You will need to wash your hands afterwards, that's for sure. The solution is quite intriguing, since there isn't any indication or any form of a hint as to whether you're pushing the buttons in the right positions or not. It's a bit frustrating at first, because the puzzle doesn't give you any feedback - It's like going through a labyrinth completely blind. Even though this seems discouraging and intimidating, I actually found it easier than I was expecting. The Cerebral Rings are described as having hundreds of possible combinations but only 8 solutions. I wasn't able to find all eight, but found two without much effort just by fiddling with the puzzle for about half an hour. 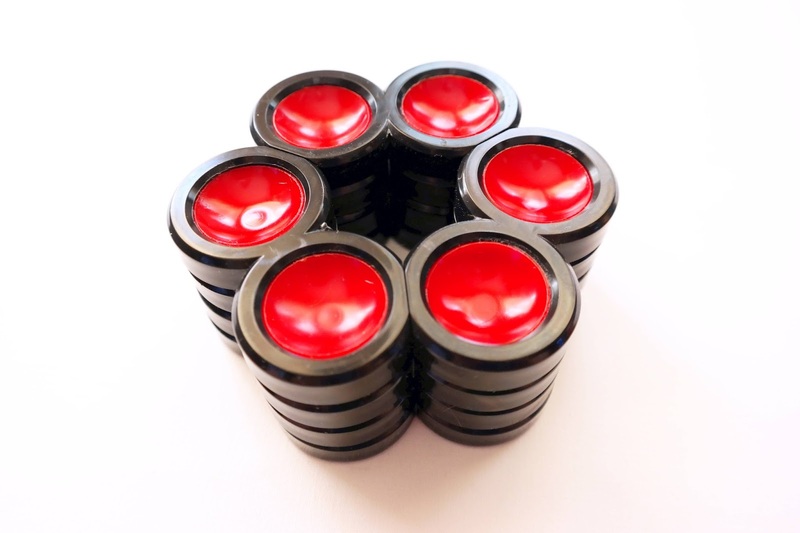 As you move the buttons around you have to keep checking by trying to pull the pieces apart until they give in. I found that trying to put the puzzle together as one piece is a little easier, but still a challenge. 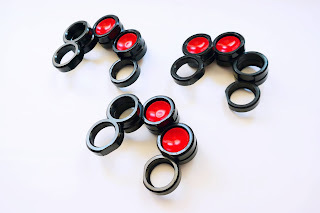 If you don't change the positions of the buttons it's easy enough, but if you do move the buttons after you separate the pieces it can be quite difficult to put it back together. The Cerebral Rings by Mag-Nif is a different kind of interlocking puzzle, but it's an interesting one. I wouldn't say it's a great puzzle, because of the lack of feedback it gives as you're trying to solve it, but considering the design and how different it is from everything else out there, it's definitely worth a try. 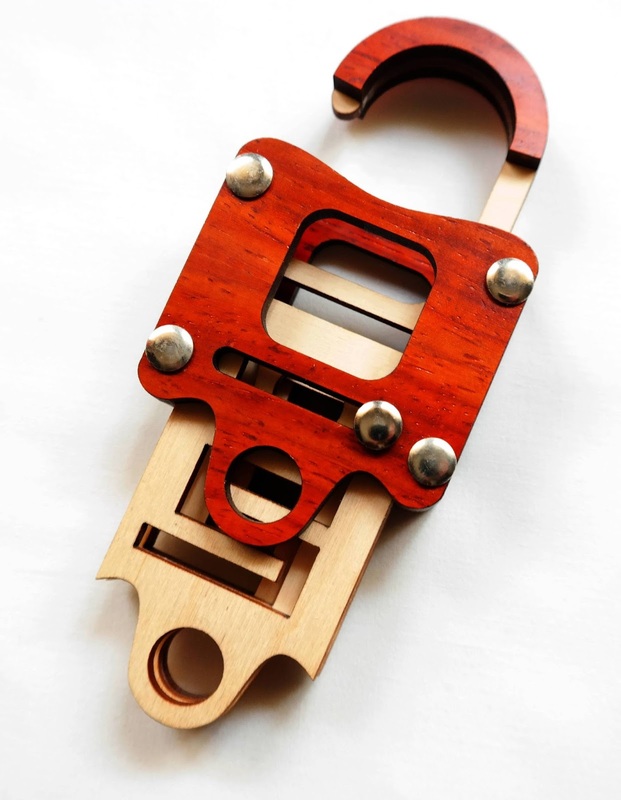 Availability: You can buy a copy of the Cerebral Rings at Brilliant Puzzles for about $15 USD. It's been 20 years since the first Wisdom Ball was mass-produced by Dr. Toyz. 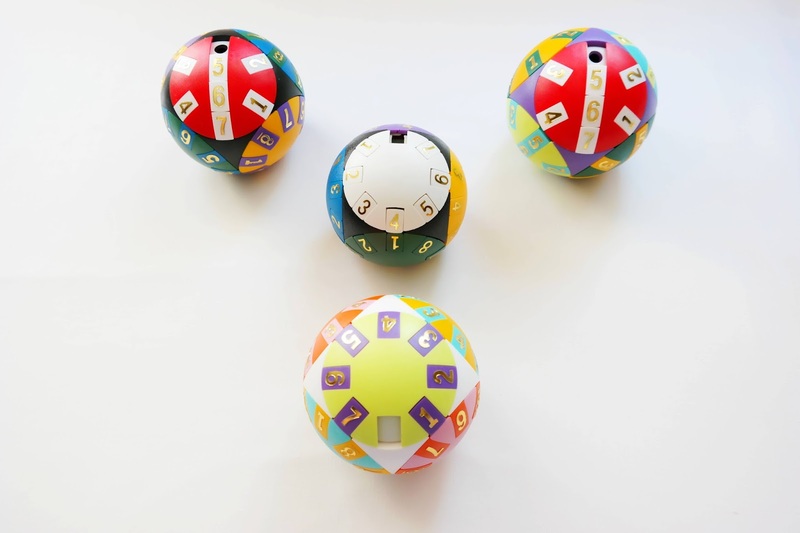 Invented by Yang Ju-Hsun, the Wisdom Ball is a sliding puzzle with a moving hole mechanism. 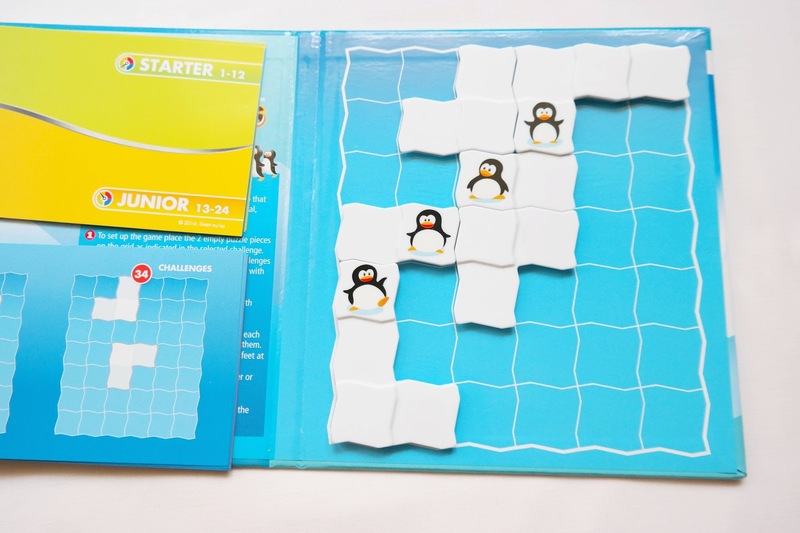 This type of puzzle is probably the most popular among sliding puzzles for its simple and easy to understand design, which can appeal to a broader range of puzzlers, both beginners and experts alike. But why am I talking about a 20 year old idea, you might ask? 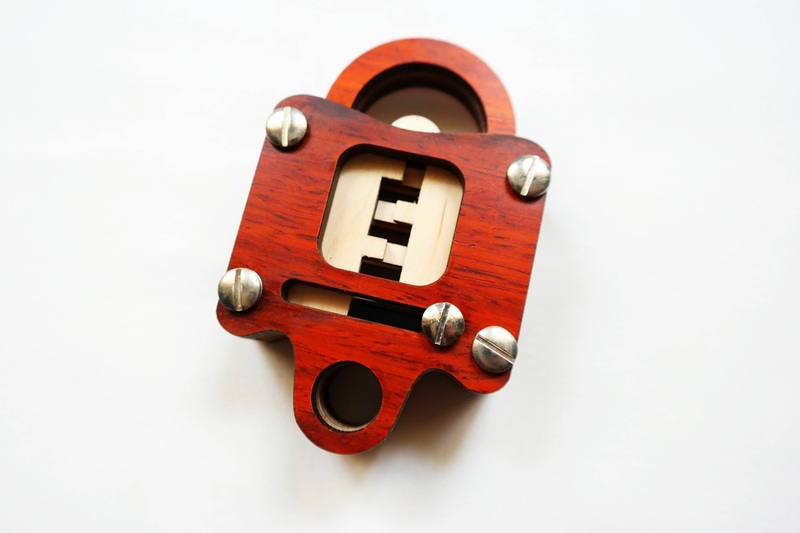 Well, because Mr. Yang Ju-Hsun has decided to revive his beloved puzzle with a new and improved design, completely changing the inner mechanism so it has a smoother movement. In this new process the designer created two additional variations, both of them more challenging than the original, but also quite addictive to play with. I've known the mechanics of the Wisdom Ball for some time now - maybe from the early days of my collection which is about 7 years - so I was quite familiar with the new designs. The original Wisdom Ball was a little smaller and the sliding mechanism wasn't that smooth, since it jammed frequently whenever you tried to move the tiles from one disc to the other. This doesn't happen with the new versions, or at least much less frequently (you do have to align the discs for the tiles to move smoothly). Also, with a slightly bigger size, the new Wisdom Balls feel much better to hold in your hands. The tiles are bigger and look brighter. In short, everything seems better and improved from the original design, which is in itself quite a big incentive to acquire these new versions. I'll write next a brief description on each of the three new versions and their unique characteristics. This is basically the same design as the original Wisdom Balls, but with an improved mechanism and overall appearance. This time, the body of the ball is white instead of black, which gives it a sense of simplicity and easiness. 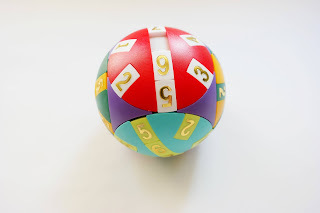 The ball comes semi-solved, and what I'm trying to say is that, even though it seems solved (the numbers are in sequential order), the colors of the tiles don't actually match with the discs'. This is you goal: rearrange all eight tiles in each of the six discs so that tiles and discs share the same colors. All you have is an empty space at a time which you have to constantly be moving across the ball to get each tile to where it's supposed to be. You can move a tile from any of the four adjacent discs relative to the disc you're seeing. The sequence of the numbers is up to you. 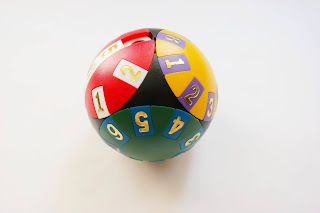 They come with a counter-clockwise order, but while solving it I preferred to do it clockwise. You have to watch out for parity problems or tiles that are upside down. Note that the numbers should always face you and not inwards to the center of the discs. It took me about 20 minutes to solve this easier version. I really liked it, because despite being easy to solve (in theory), it's still challenging but never frustrating - just pure fun. The movement of the puzzle is smooth as butter and when solved provides you with quite a rewarding feeling. After you've solved it you can go for another challenge and do it with a different sequence - Maybe alternating colors or numbers. Video: Check out the movement of the Inspiration version. The Advanced is the intermediate level, and prepares you for the most difficult challenge, the Wisdom. The body of the Advanced is black, contrasting with the Inspiration version, and the colors of some discs are also different. This mostly serves as a way to distinguish between versions, but for me, as a collector, I also appreciate the subtle differences that makes each version unique. To make it more challenging, the Advanced features four tiles in a row across the middle on opposite discs. The tiles that located in this line don't interact with the tiles within the same disc. If, for example, you want to swap a tile from the middle line with one from the edges on the same disc, you need to move it through an adjacent disc and again though another in order to place it in its correct spot. Again, you need to make sure it has the correct orientation (facing you). 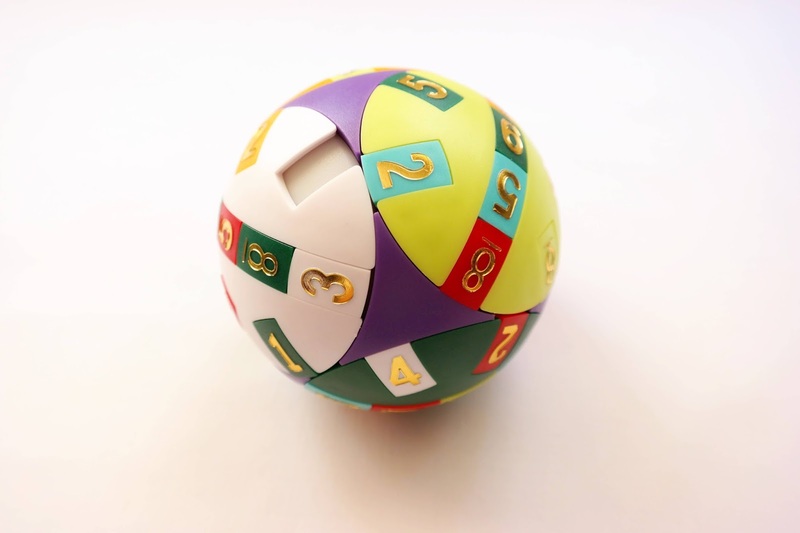 When solved, the Advanced ball will show the numbers from 1 to 8 in sequential order on four discs, and the other two opposite discs with numbers from 1 to 4 on the edges and the rest in sequential order from 5 to 8 (or 7, counting the empty slot). Because this one is much more difficult and needs more patience, I haven't been able to solve it yet. From my experience, this can be done within an hour, but I'll have to test it to see if it requires more time. Video: Check out the movement of the Advanced version. This one is quite an intimidating puzzle. The Wisdom version has a straight line of tiles across the middle of all six discs. This is quite a challenge and one that needs to be tackled when one feels confident enough to spend (or waste - depending on your skill level) a couple of hours without too much stress (if that's even possible). The Wisdom version has a purple body and a mixture of colors from both of its predecessors. It also comes semi-solved, so you have to reorganize the tiles into their respective disc colors. 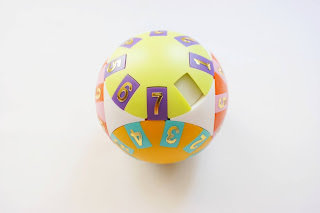 To move the tiles in the middle across the whole perimeter of the ball, you have to align all four discs from top to bottom and rotate the entire line of tiles. This requires a bit of dexterity, but can be easily done. When solved, the Wisdom ball is pretty much the same as the Advanced for two of its discs: numbers from 1 to 4 on the edges and 5 to 8 (or 7, because of one empty slot) on the middle lines. If the Advanced version is already a pretty good challenge, you can certainly imagine what this one really is when it comes to solving it. Even the process of mixing the tiles is a challenge in its own right, but quite fun, I might add. After that, though, the fun stops and frustration settles in... If you're a beginner, this one is not for you. But you can always practice with the other two and eventually you'll be able to do it on your own. Are you courageous enough? Video: Check out the movement of the Wisdom version. 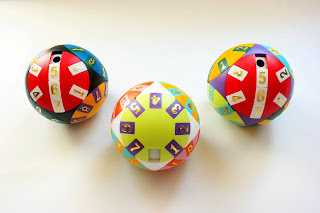 The new and improved Wisdom Balls are a great addition to any collection or to any puzzle fan who likes a good challenge. This is what the improvement to an old version looks like when done right. Everything behaves and looks as it should be. 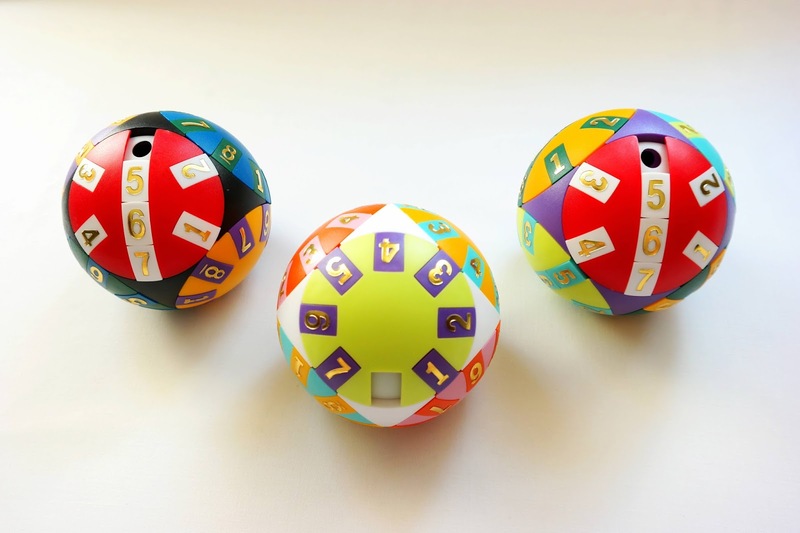 As for me, I'll continue to have lots of fun with the other two Wisdom Balls until I'm able to solve them. 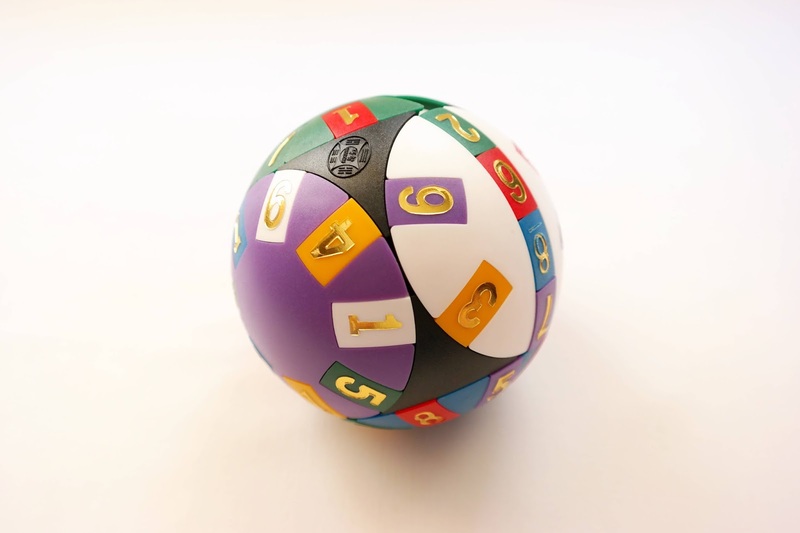 Availability: The Wisdom Balls will soon be available at HKNowStore and PuzzlesdeIngenio.com. The official Wisdom Ball website will also be live in the next few weeks, so stay tuned for it. 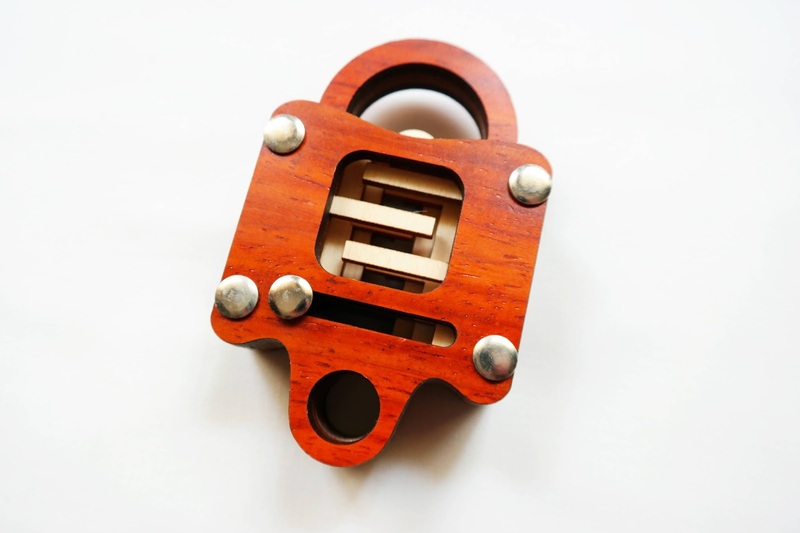 Funzzle is a collection of four bamboo interlocking puzzles, quite challenging and affordable. These puzzles are made by Y. Gong, and even though it says on the box that he is the designer, I have to warn you that they are based on original works by Stéphane Chomine, Yavuz Demirhan and Tamás Vanyó. They were made without the consent of their original designers, so it's up to you to decide if they are worth it, because these are cheap copies. Leaving the copyright issues aside for a moment, I'll move on to the actual puzzle. 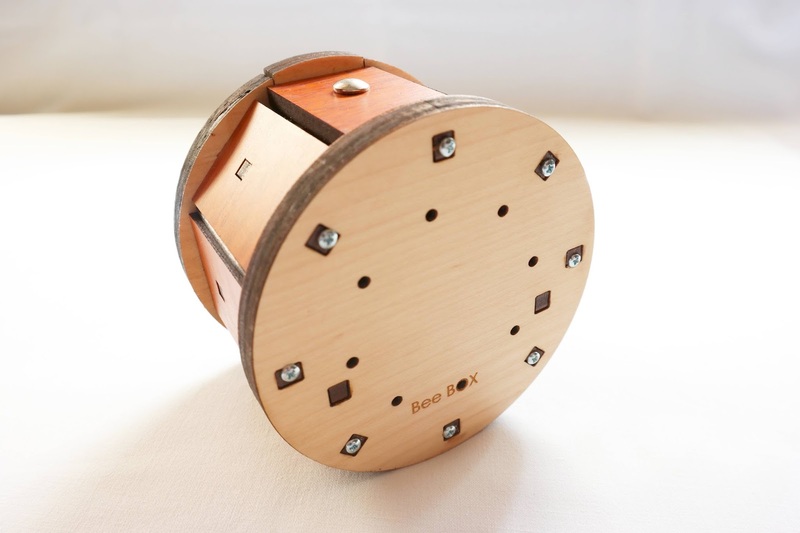 The model you see above is called Beta and it's based on Stéphane Chomine's Quadripole. 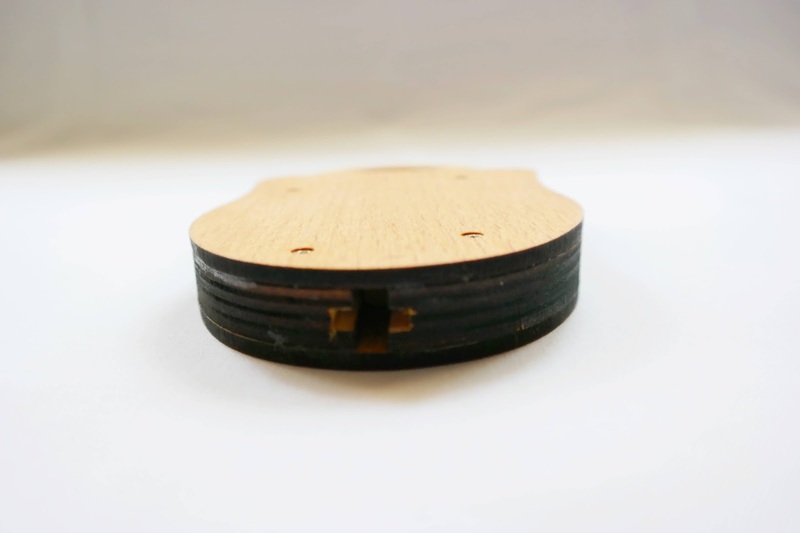 It's made entirely from bamboo wood, which gives it this lighter color and makes it lighter in weight as well. 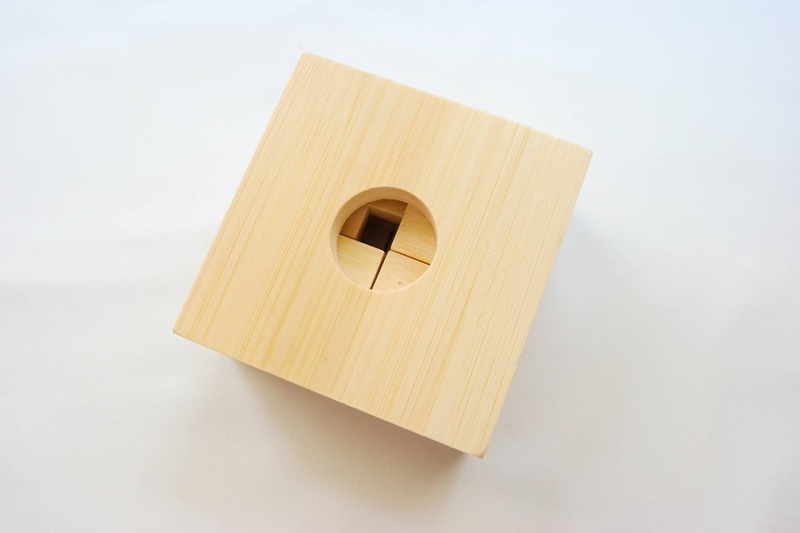 I like the appearance of bamboo in some puzzles, but in all honesty, it does make them look cheap and low quality. Made with just four pieces and locked tightly inside a wooden frame, the puzzle is as hard to solve as they come. To solve the puzzle you need to remove the pieces one at a time by shifting them around the tight space of the frame. You also have a hole at the bottom to help you move the pieces. Rotations will be needed, as you struggle to find the correct arrangement to remove just the first piece. As soon as this is accomplished, the other three pieces will, more or less, be easily removed. I spent some time to solve the first part of the puzzle (taking it apart), but so far the reassembly has taken the best of me. The process is just the reverse of the first part, however it has to be done with more planning and a good analysis of each piece. I'm not very good at interlocking puzzles, so this will probably be left as is. It's definitely not a puzzle for beginners. If you like them extremely challenging, this one's for you. The Beta puzzle by Funzzle is an average puzzle at best. The quality is not very good and the fact that it's a copy of the original by Stéphane Chomine is enough to stay away from it. If you don't care for any of this and like difficult puzzles, then it's an affordable way to get a good challenge. Availability: The Beta puzzle is available at PuzzleMaster for $15 CAD.